Random fact: I play tennis and am a huge Rafael Nadal fan. When I met him, he kissed my cheek. Camila began working on her family's coffee farm, Arbelia, in New Oriente, Guatemala, after graduating from Southern Methodist University in 2011. As the fourth generation to work the farm, Camila began implementing new agronomy practices (such as enriching the soil with worm compost and promoting biodiversity) and processing methods that yielded better outcomes. She became head of the farm and the key contact for all coffee-buying clients. She was also vice president of the Guatemala chapter of the International Women's Coffee Association. Camila has traveled to El Salvador, Colombia and Mexico to meet women coffee producers and learn what producers in other countries are doing on their farms. 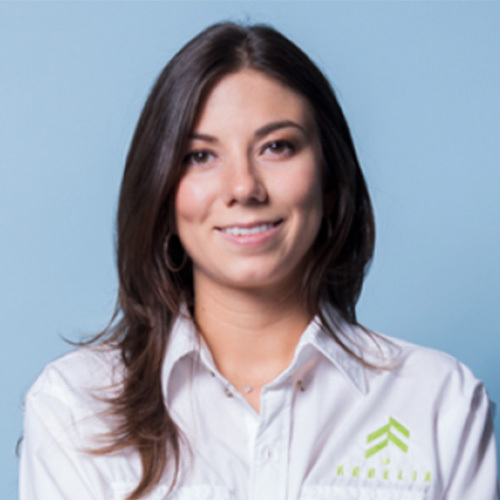 In 2017, Camila joined the InterAmerican Coffee team in Houston as a trading assistant, and she currently focuses on position reconciliation, calculating margins, selling and releasing coffee and creating purchase contracts. She is thrilled to be living in Houston and learning the importing/trading side of the business. Favorite company outing: Helping build homes for Habitat for Humanity. Best coffee memory: My most exciting and fulfilling experience in coffee so far was when I sold the first microlot from my farm to a client—who has been buying green coffee from us since.